This page provides a means of viewing photographs of parts in over 150 different LEGO colours. Use the drop-down lists above to find colours you're interested in. The official LEGO number for some colours is not known. We've given them a number in the 900 number range to enable them to be added to the database. The colour name in brackets (...) in the gallery is the BrickLink name. 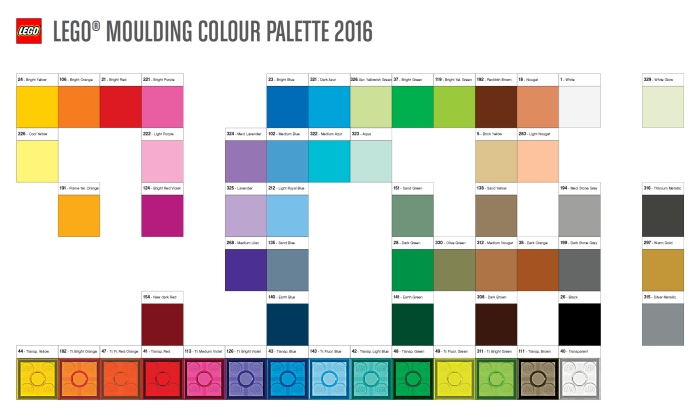 This is the official colour palatte showing all colours currently in production in 2016. Click on the image for an interactive version.